Lock in a great price for Mas Djoliba – rated 9.1 by recent guests! Laura and Delphine were extremely kind and gracious hosts. Their love for Antibes and the surrounding area is reflected in they way they interact with guests and provide a welcoming environment. The hotel is located in a residential neighborhood, but some restaurants and the beach were only a 5-10 minute walk away. Old Antibes and all it has to offer is about a 15 minute walk. The rooms were very clean and the hotel had a lovely pool area. The staff is quick to provide restaurant and activity suggestions. 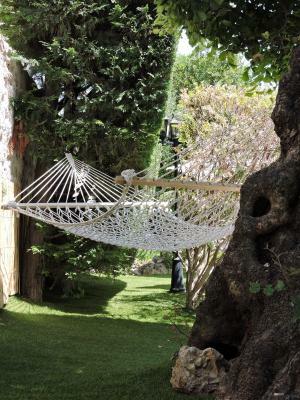 Pleasant, quiet little garden hotel, a shortish walk to the centre of Antibes. Very helpful receptionist. Good breakfast on a covered patio overlooking pool and flowers. Bed comfortable and pleasant terrace, though our room was a bit small (not enough space for all our cases). Bathroom was OK, though the shower was in the bathtub with flimsy nylon curtains. Good 3 star standard generally, but the pleasant surroundings make it more attractive than a normal town-centre hotel. The hotel is lovely and we stayed in room 18 which is a large suite that would accommodate a family of 4. The bedroom has a door and the other 2 single beds are located in the living room area. 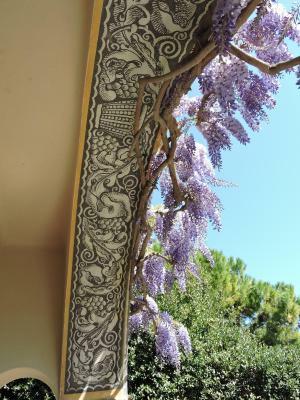 The hosts are incredibly kind and we enjoyed the location as it was quiet yet a short walk into Antibes. We opted for breakfast and it was limited but convenient and good. It was magical. The atmosphere felt like it was remote, yet it was ideally centrally located to all necessities. Definitely a retreat in every way. Very well staffed. Pampered and relaxing feeling as well as safe and quiet surroundings. Eager to return. This is a beautiful villa style boutique hotel nestled in a quiet area just a very short walk to beaches and entertainment. The management and staff could not have done more to make our stay any more enjoyable. We will definitely be back again!!! The property was nice, the directions to/from the location and how to get in/out at night were also clear. Antibes is a nice small town with many cafes and restaurants. I wish I had more time to enjoy them. location was only a short walk to the old town and the market . Lovely staff who made sure we felt comfortable and happy. My sistr was ill one morning and they enquired after her welfare and made sure she got some breakfast in her room. 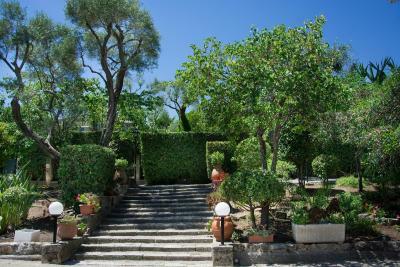 The garden is lovely, the view is spectacular, and its very well located... quiet area but easy walk to everything. One of our best sellers in Antibes! Mas Djoliba is a 6-minute walk from the beach in Antibes. It is set in a park and has swimming pool and terrace. Free Wi-Fi is available in the rooms. Each air-conditioned Djoliba room is equipped with a TV and private bathroom with a bathtub or shower. From May to September, snacks are available and can be enjoyed on the terrace or next to the pool. 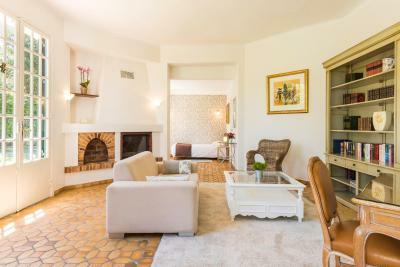 Mas Djoliba provides an ideal base for exploring Antibes-Juan-Les-Pins. 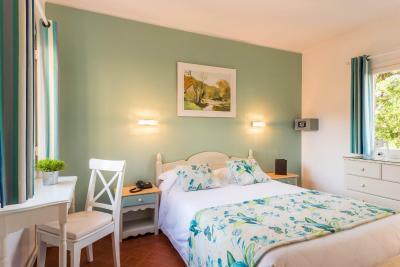 The hotel is 0.6 mi from Chateau Grimaldi and Antibes Cathedral and a 10-minute drive from Gare d'Antibes, Antibes’ railway station. 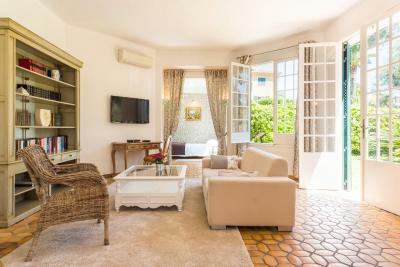 For guests wanting to discover other parts of the French Riviera, Mas Djoliba is conveniently located 7.5 mi from Cannes and 14 mi from Nice. A free and private locked car park is available. When would you like to stay at Mas Djoliba? 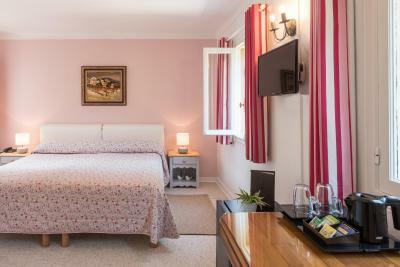 This room is equipped with a private bathroom, flat-screen TV and air conditioning. 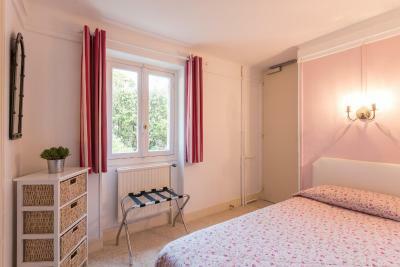 This room is equipped with a seating area, private bathroom, flat-screen TV and air conditioning. Extras include a 20m2 terrace with sea views. This suite has a tile/marble floor, mini-bar and private entrance. Extras include a 250 sqm private garden and a parking space. House Rules Mas Djoliba takes special requests – add in the next step! Mas Djoliba accepts these cards and reserves the right to temporarily hold an amount prior to arrival. If you expect to arrive after 22:00, please inform the property in advance. Contact details can be found on the booking confirmation. Please note that the car park closes from 22:00 until 07.30 with no access possible. Spaces are limited and reservation is not possible. The property is not serviced by a elevator. Please note that if guests smoke in the room, an additional night will be charged. Please inform Mas Djoliba of your expected arrival time in advance. You can use the Special Requests box when booking, or contact the property directly using the contact details in your confirmation. the cupboard was in the bathroom ! Everything was great, no complaints at all. In an ideal world the pool would be heated in October, but of course this would bump up the prices. Cold pools are normal in France unless you stay in a 5 star, and I had a good tingly swim anyway! Beautiful oasis of calm yet walking distance from the old town and the sea. 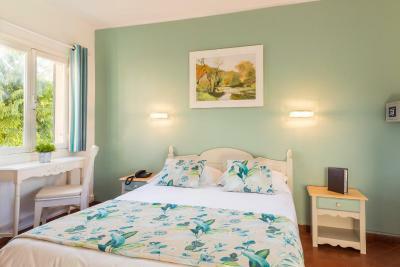 Comfortable bed, well-kept gardens and pool, characterful villa, very friendly and helpful staff who radiated positivity. 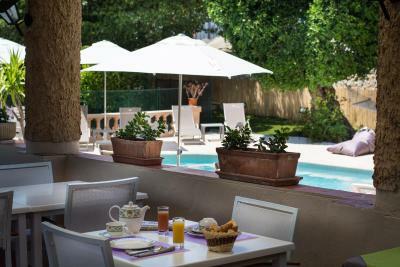 Hotels in Antibes are expensive for what you get - I have been to Antibes many times, and if you are considering staying at a 2-star I would encourage you to pay just a bit more and stay here (3 star) instead. Well worth the difference. Narrow street with cars parked opposite the entrance made access to the car park a challenge. Our satnav took us up the street from the east, but approaching from the wider western side is much better. Beautiful hotel perfectly situated for Antibes town, the cape and Juan-Les-Pins, yet quiet and restful away from the hubbub. The staff were so kind, friendly and helpful too, which we particularly appreciated as first-time visitors to the region. Quirky hotel with every convenience! One of the best places I've ever stayed. We would recommend to anyone, a perfect oasis. You couldn't wish for nicer or more helpful staff. Am now considering returning next month for my 40th birthday. Mas Djoliba is a hidden gem of a hotel. The staff were very friendly and extremely accommodating. I travelled with a friend and will return with my family. Haven of peace and tranquility! The pool area was lovely, very relaxing. Lovely breakfast.